When I first moved from New York to D.C., I was so excited to actually have an apartment that was big enough to entertain guests. Owning a farm table, let alone living in an apartment large enough to house one, was a pipe dream as a 24-year-old New Yorker. 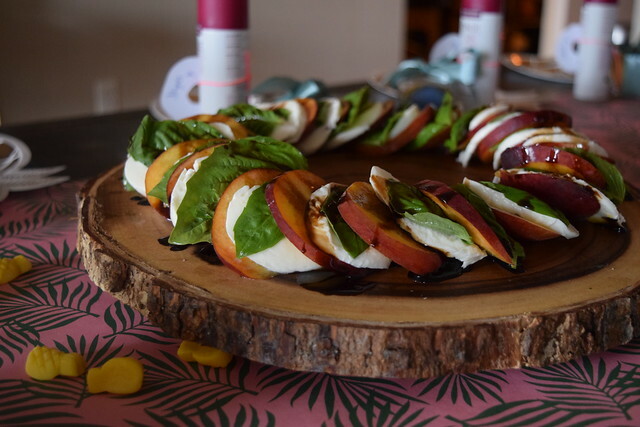 My first summer back in the District, I hosted a ladies summer brunch as a way to gather my people during a hectic season. Three years later, it’s become an annual tradition that I look forward to every summer. 1-2 months out: Come up with a theme. Pin all the pins. Send the invite. Get excited. 1 week out: Panic. Consider hiring a personal assistant to help me achieve all the pins. Day before: I’M NOT GOING TO HAVE ENOUGH FOOD, MY FRIENDS WILL LEAVE HUNGRY AND NEVER TALK TO ME AGAIN. Go to the grocery store and spend $100 on crostini. Not this year, my friends! I’m here to show you how to host a memorable, relaxing, and fun summer day with your girls—without hiring a personal assistant. 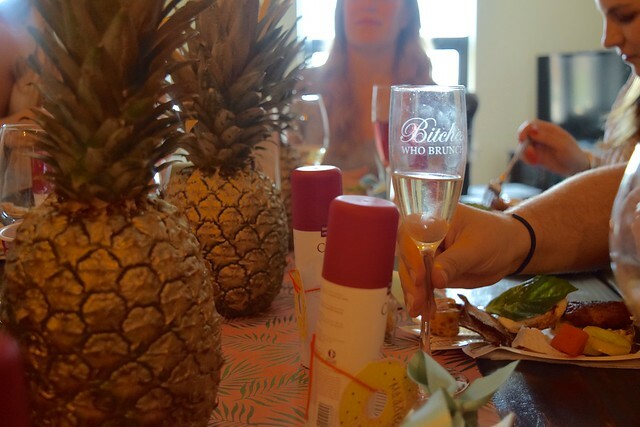 Last year my theme was “Rosé on the Roof” and this year, “Massages and Mimosas.” For me, a theme simply keeps me on track, otherwise I’d drive myself nuts with endless options and overly ambitious projects. The best way to come up with a theme is to consider your resources, your crowd, and your space. My girls are all busy, working ladies, so I figured they would be excited for a little relaxation in between sipping on mimosas—that’s where Zeel, an at-home massage service comes in. The app is genius and the service couldn’t be more convenient. 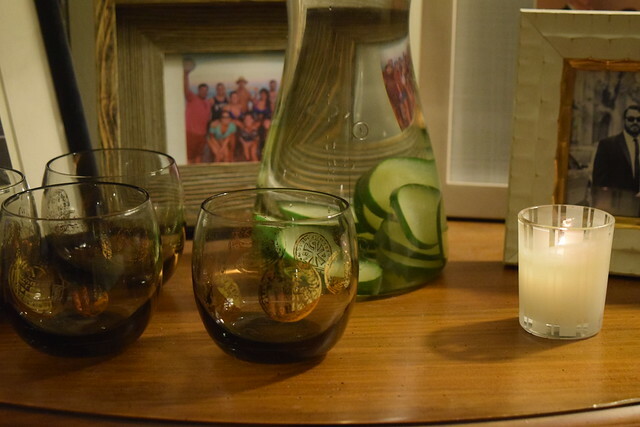 I created a spa-like setting in our second bedroom by setting up cucumber water and a votive candle next to the massage table, provided by Zeel. Each girl left their 10 minute massage like a wet noodle and utterly relaxed. If you have a more active crowd, maybe a DIY flower arranging activity would be better suited. Or if you’d just like to focus on catching up, a simple waffle bar is different, fun, and still brings an interactive element to the party. Place cards set the tone for the party and also allow you to mix up your guests. 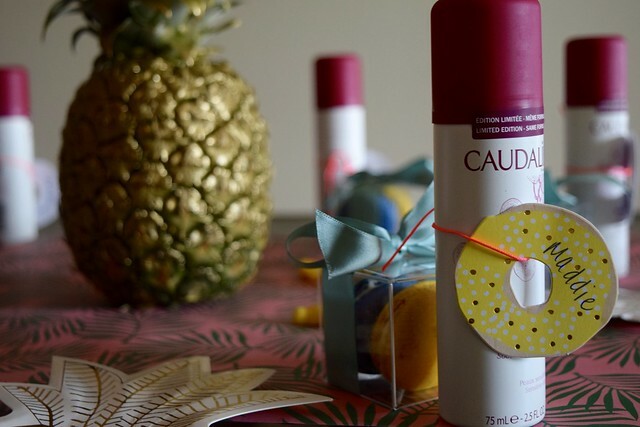 I wanted to go with something that was useful and cute, and these mini grape water hydrating mists from Caudalie fit the bill. I liked how they were perfect for my girls to stash in their carry-on bags for upcoming summer travel. Plus, we were sitting in the sun on my roof, so they came in handy during the party! 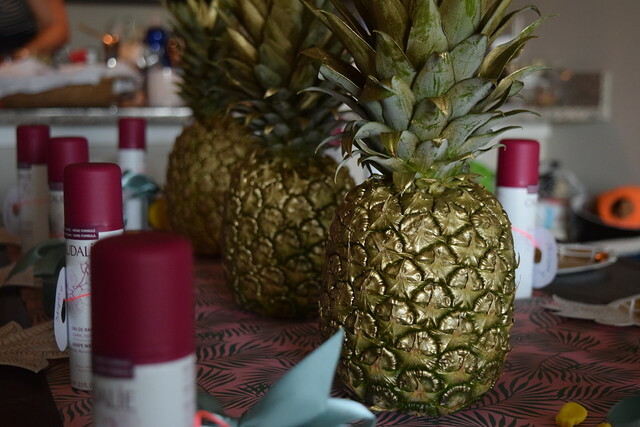 Instead of a predictable floral tablescape, I decided to highlight my favorite tropical fruit with an easy DIY. Grab a can of spray paint and some newspaper and douse three pineapples to your desired color (this can also work on lemons, apples, etc.). I went with a metallic gold to elevate the pink palm print table runner. 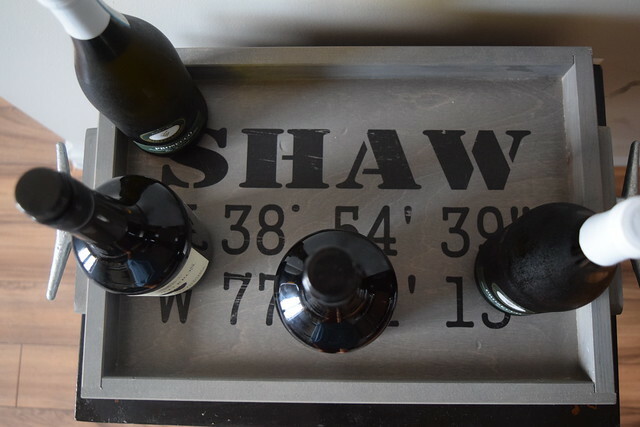 I also love to add personal touches that are functional, like this nautical custom serving tray gifted by SeaGate Studio, which pays homage to our neighborhood of Shaw. It helped corral the booze in an organized, cute way. The New Hampshire-based Etsy shop can personalize pillows and various household accessories to commemorate a special couple or place. I find that it’s always best to have a crowd pleasing appetizer immediately available, as guests arrive in waves. 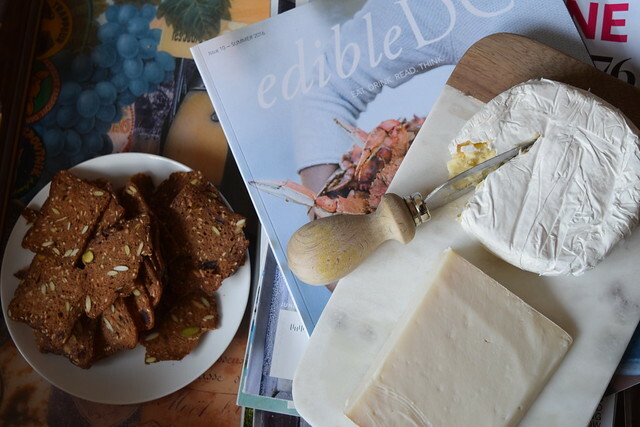 DC-based Righteous Cheese has pre-curated brunch collections of cheese, crackers, and jams to take the guesswork out of choosing the right flavor combinations for your guests. The pistachio-cranberry crisps with a variety of soft and hard cheeses were the perfect start to our meal. To get extra mileage out of the box, I ended up serving the jams in little bowls next to the latkes, along with plain yogurt. 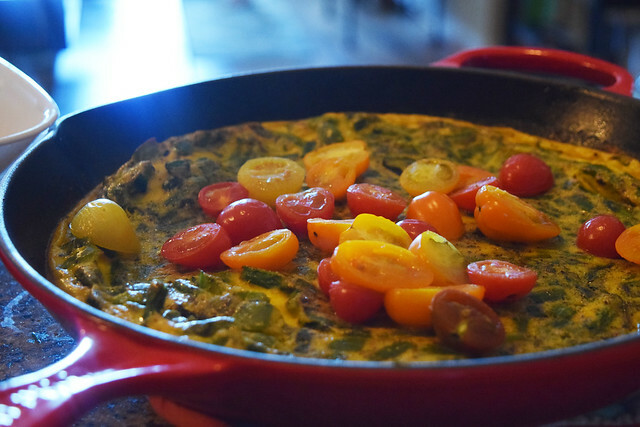 The rest of the menu consisted of light seasonal fare: an asparagus and tomato egg frittata, a peach Caprese salad, mixed berries with a gluten-free crumbled jam and oats bar, potato latkes, and watermelon and cucumber mint salad. Of course, I couldn’t resist cutting up some Queen B pastries from my favorite neighborhood bakeshop, Buttercream. Here’s another element that can tend to be costly when hosting a party. 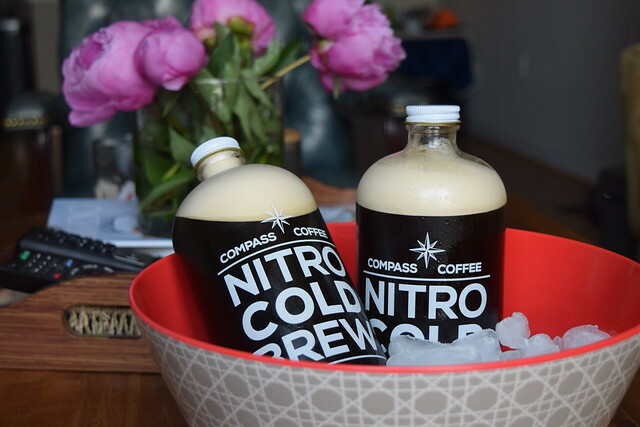 I had growlers of cold brew from our neighborhood coffee shop, Compass Coffee chilling as guests arrived. Beyond that, I stuck to mimosas, although we ended up tapping into our reserve of rosé later that afternoon. 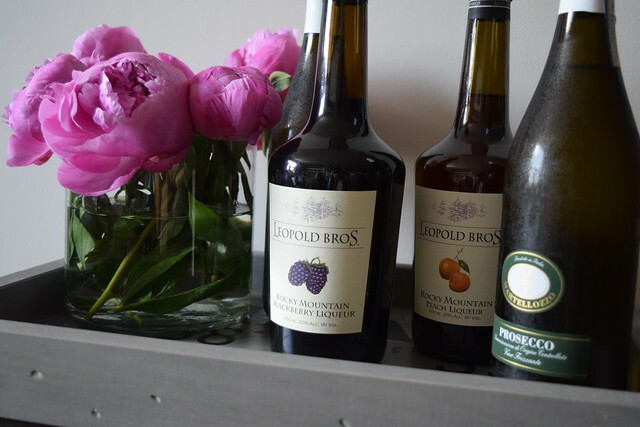 To make the mimosas a bit more fun than the traditional OJ and champagne, we had two bottles of Leopold Bros. Rocky Mountain Liqueur in blackberry and peach. The splash of liqueur in a glass of champagne added a fresh fruit taste without the nuisance of fresh berries bopping around in your drink. We couldn’t decide which flavor we liked more, so we just kept rotating between the two. Chocolate is nice, but in the summer the sweet treat can turn into a melted mess. 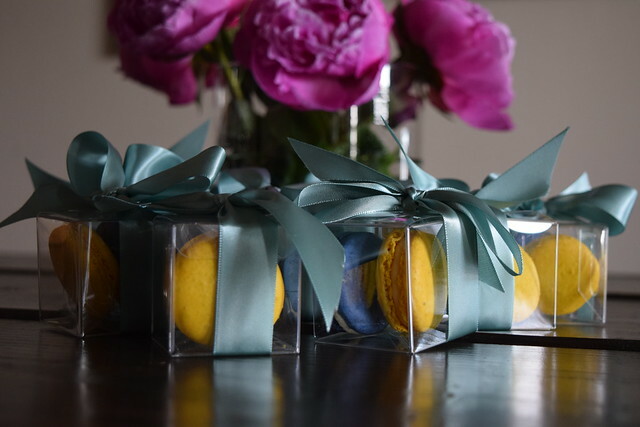 I opted for bright colored Olivia Macarons in pint-size packages that were easy to grab and small enough to fit in a purse on your way out. The blueberry and lemon basil flavors were the perfectly complement to our seasonal menu.